Born Pretty Store is an Asian-based online store selling very affordable products, reaching from accessories to make-up and beauty products. They have a super huge amount of all kinds of nail art products and tools. I have tried many of their nail art products in the past and the products were good and affordable. >Here< are some of the products I reviewed before. I’ve been asked by the very nice people from Born Pretty Store, if I can try some of their new makeup products from their brand Bonnie Choice. I selected these two Bonnie Choice Eyebrow Pencils and a double-sided eyebrow brush from the same brand. 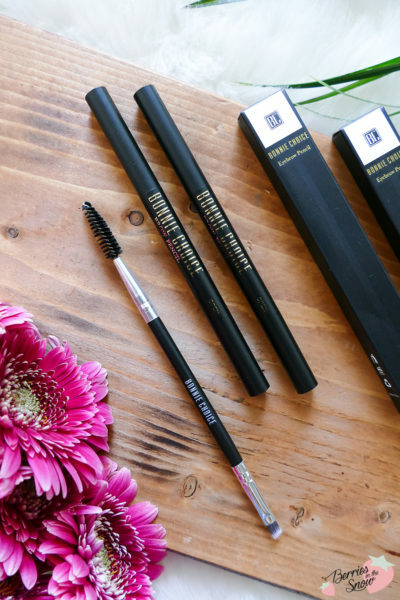 The Bonnie Choice Eyebrow Pencils are automatic eyebrow pencils that are waterproof and long-lasting. There are 6 different shades available and I chose shade 01 and shade 05, a black and an ashy brown tone. 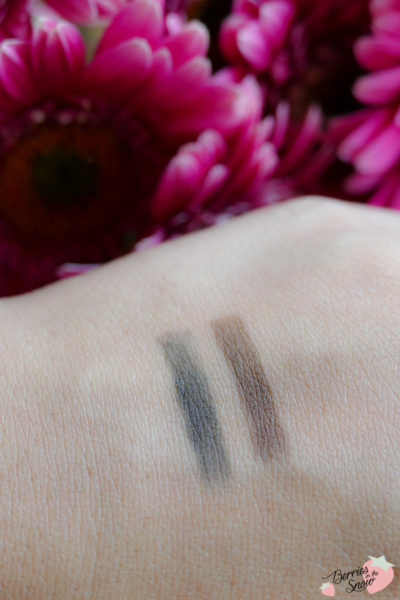 I have black eyebrows and any lighter shades will look quite strange, but these two seem to fit according to the swatches according to their product description. The packaging of the products is simple and neat, nothing special. All the products have a signature black color and the name of the brand. Each of the pencils came packed in a cardboard box with the ingredients listed. 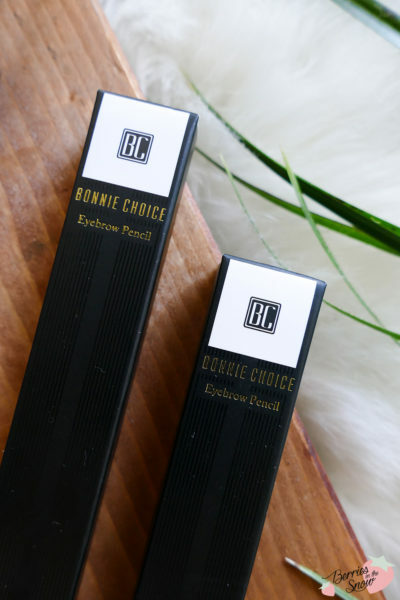 The Bonnie Choice Eyebrow Pencil has two sides: one containing the bullet, which is rotatable, and the other side a brush protected by a cap. 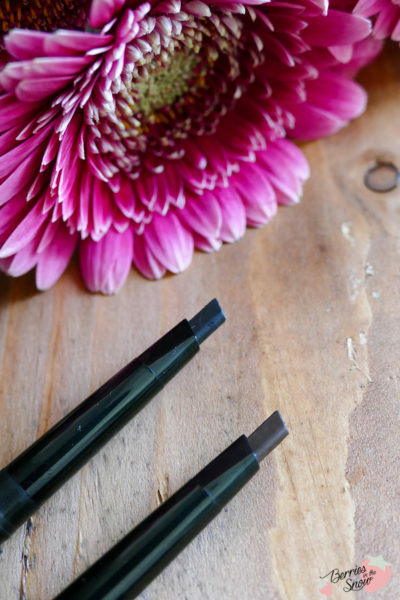 The bullet has a triangular shape and is perfect for designing eyebrows precisely. 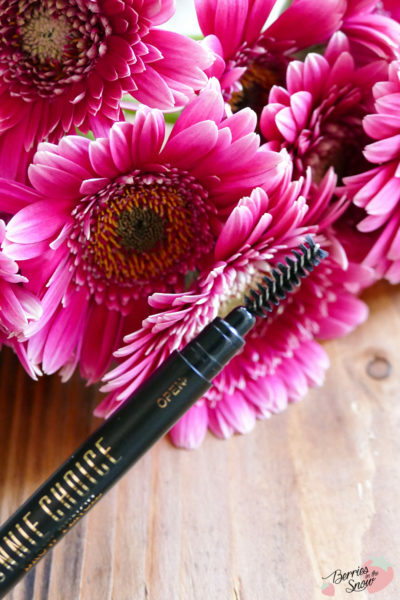 The brush is suitable for brushing the eyebrows and does its job in a good way. The swatches of the two eyebrow pencils show off distinct colors as I expected. 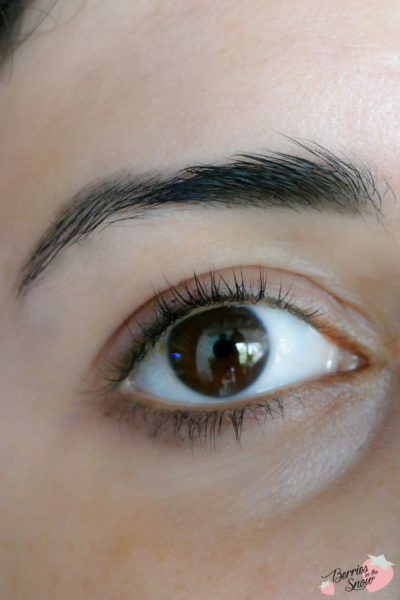 They are perfectly pigmented for creating a natural eyebrow look. The color stays in place after rubbing – but only to a certain extent, of course. I would not say that it is 100% waterproof, but it will last you all day. From the two colors shade, 01 is the shade to go for me, although shade 05 can also be used, but doesn’t blend in so naturally as shade 01. You can see the swatches below, 01 on the left, and 05 on the right. I also received an eyebrow dual-sided brush together with the two pencils. This eyebrow brush has an angled brush on one side and a helical comb on the other side. This brush is perfectly suited if you have an eyebrow palette that doesn’t come with any brushes. 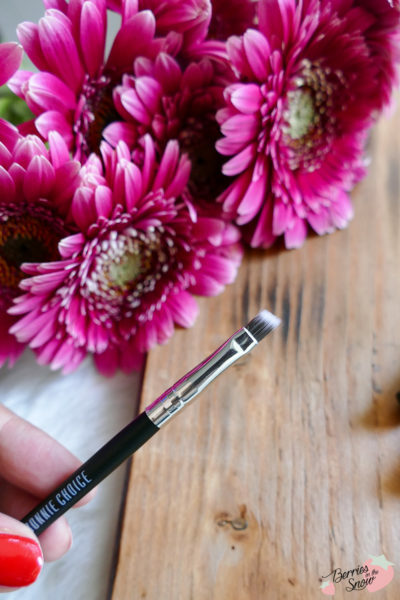 The angled brush is perfectly designed for creating a nice shape with your eyebrow palette, and the brush can be used to brush your eyebrows in the desired shape. Far more important is, that it is very affordable! 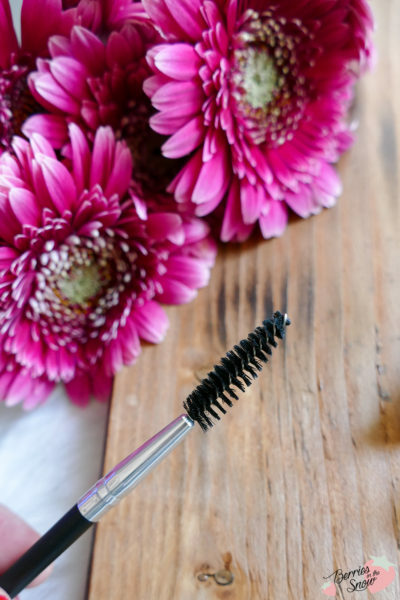 All in all, we have a couple of very decent and affordable makeup products here, that will help you to achieve a nice and groomed eyebrow look. 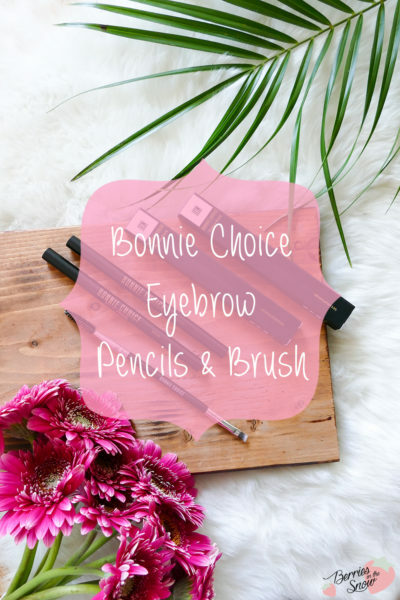 If you have been looking for cheap, but good eyebrow products go for the Bonnie Choice Eyebrow Pencils! I really like the texture and the natural color pay-off. I personally have enough brushes, but if you are looking for a cheap and useful brush I can also recommend the Bonnie Choice Dual Eyebrow Brush. Just as a short reminder: All products mentioned and reviewed on this blog are of my personal opinions. This product here was sent to me for reviewing purpose by http://www.bornprettystore.com/, which doesn’t influence me in providing my honest opinion on the products. The tip looks similar to some much more pricey versions. I try to use affordable eyebrow pencils as I go through them so quickly. Me too! 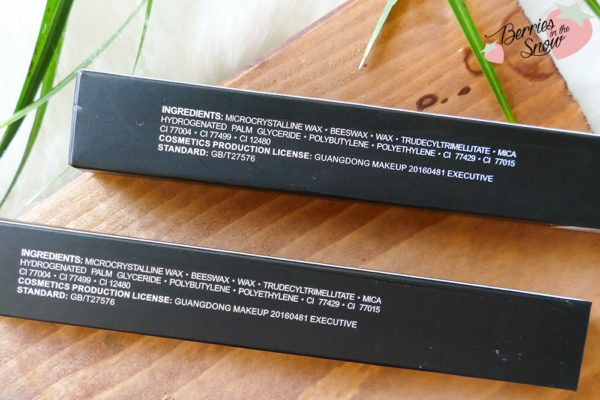 I think many people will love to see a makeup pencil that has versatile shades and is really affordable! Einen Ähnlichen gibt es von LOV. Den habe ich vor meinem Mircoblading immer verwendet. Was für Erfahrungen hast du mit dem Microblading gemacht. Bist du zufrieden?Erzähl mal! Der Eyebrow Pencil macht auf mich einen super Eindruck! Glaube der könnte mir auch gefallen. Ich finde auch echt super dass es da so viele verschiedene Farbtöne von gab…und das sie zwar pigmentiert, aber nicht super übertrieben, sondern natürlich ausfallen. Der Preis ist auch noch ein Plus! Ja, also so eyebrow pencils sind immer super easy zu verwenden! Die sind echt toll, weil sie günstig sind und es viele verschiedene nuancen gibt…und die Dreieck-form ist auch perfekt! 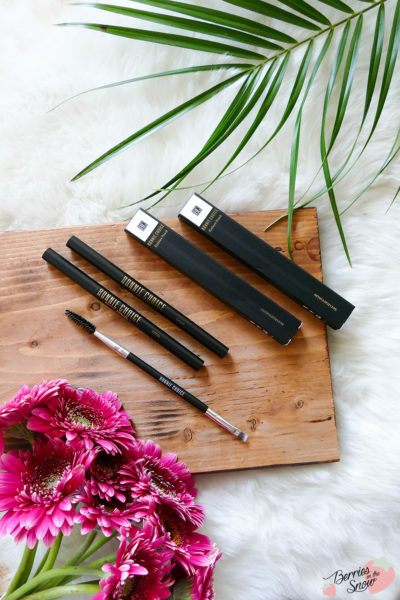 These brow pencils sound effective and they are certainly very affordably priced. It’s nice that they offer a black shade. I sometimes have problems finding brow products that are dark enough for my brows. I have the same problem with my black eyebrows! Most pencils seem to be too reddish/brown that it looks so strange…the shades here are really nice and fit perfectly, and the pencils are so affordable! Sound good, thanks for the great review. Thank you! The brand is new, as far as I know. But I really enjoyed using the products and I can recommend them! I agree! I was surprised to find the brush on the other side to be honest :d I thought it will be simply the pencil :D Thanks for the comment!